The Soviet Senezh studio tried to bring about Cosmic Communism through designed 'environments', but ended up stuck in yesterday's future. The fluctuating gauge of revolutionary ambition can be tracked through the appearance and disappearance of a model of a building that was never brought into being. Tatlin’s ‘Monument to the Third International’, or ‘Tatlin’s Tower’, with its spirals and scaffolds, representing quantities of iron, glass and steel that would have been hard to come by when it was first conceived just after the Russian Revolution, has been patched together in miniature form at regular intervals since its first appearance in street parades in the young Soviet Union, and at the International Exhibition of Decorative and Industrial Arts in Paris in 1925, modelled in wood, tin and paper. This flimsy form represents a dream of an information centre, with venues, a cinema, radio transmitters, poking, at 400 metres, into the clouds, with each cogwheel-like segment rotating at differing speeds. A model of revolutionary ambition, became a sign of a utopia that was never to be, could or can never be. Mawkishly, we hold onto it, an emblem of disappointment, a sadly never was sentimentally emanating from the various models of it erected at the modern art museums in Stockholm, Paris, at the Sainsbury Centre in Norwich and at the Royal Academy in London; and in its various translations by Dan Flavin, Rem Koolhaas or, more latterly, in the grand-scale twinkly chandelier by Ai Weiwei, where it is renamed as Fountain of Light, glimmering Instagrammably at the heart of the international art world in the Louvre Abu Dhabi. The Monument to the Third International, as well as Letatlin, a human powered flying machine, conceived and modelled by Tatlin at the end of the 1920s, appear some way into Soviet Critical Design: Senezh Studio and the Communist Surround, Tom Cubbin’s study of the design studio known as Senezh, which developed at the Central Experimental Studio of the Soviet Union of Artists between 1964 and 1991. Designers at Senezh had a specific understanding of the capacities of design, an understanding developed in opposition to official technocratic solutions, and prized aesthetic, imaginative, speculative approaches. One of Senezh’s chief designers, Evgenii Rozenblium, described Tatlin’s Tower as an example of pure artistic ‘projecteering’. Senezh was devoted to absorbing ideas from wide sources in order to advance their mission of producing an authentically communist design culture, which would in turn bring about the emergence of authentically communist social relations. From the early days of Senezh’s formation, in the later 1960s, they sought inspiration by attending seminars on the mass festivals from 1918 to 1920, festivals that were conceived as first steps towards a theatre of the future that would take place on the streets, engendering widespread creativity and active participation in the social whole. Senezh designers rediscovered Tatlin for the Soviet Union. They staged the first public exhibition of his work since the 1930s, at the House of Literature in Moscow in 1977. Here a reconstructed model of Tatlin’s Tower formed the centrepiece, its reconstruction overseen by an architect who had helped build the original model with Tatlin himself. In 1981, versions of Tatlin’s models of the Tower and the flying machine appeared in Senezh’s Cosmic Cultural Centre project, in the 1981 Moscow exhibition We are Building Communism. At this point, designers in the Soviet Union, had been encouraged to turn to the concept of ‘environment’ and, thereby to draw together disparate strands of architecture, monumental art, urban planning and what was called ‘visual agitation’. By this they meant slogans and imagery on banners or murals, that decorated urban space. These were to act as ideological stimulants, or, as official speak put it, in a declaration in 1971: ‘Persistent efforts need to be made to establish an atmosphere of mass creativity and intolerance toward technical and scientific conservatism and stagnation’. How to make an environment that would keep the citizenry ideologically attuned, actively involved in the day-to-day affairs of the Soviet Union? The ‘environment’ of the Cosmic Cultural Centre was itself only a model of a potential reality. At the exhibition, it became part of a history of environmental social forms and mythic inventions from across the world and across time. These included a Japanese rock garden, a Medieval square, Breughel’s Tower of Babel, modern space rockets, and the 19th century thinker Nikolai Federov’s ‘Cosmism’, which imagined human bodies resurrected from ancestral dust, re-engineered to live in the outer cosmos. Here, Tatlin’s models were set firmly within a utopian context, an impossible one of invention, speculation and dreaming, but joined together with science and technology at its most exploratory. This modelled a projective imagination that shines a light on possible futures by imagining completely different modes of living – it took place not in the Soviet Union that then existed, but in one that was far better. What Senezh’s work here represented was the commitment to finding an alternative universe, an underground where dreams could be cooked up, in proximity to, parallel to but not in accord with official policy. A striking example of this explored in Cubbin’s book is an Underground Cultural Centre, entered by a staircase in a derelict courtyard. This leads to a warren of tunnels housing cinemas, libraries, theatres, shops, a disco, a space devoted to Leonardo da Vinci, a pyramid, and a medieval crowd, amidst screens live-broadcasting from across the world. In pursuing the history of Senezh and its twists and turns, as state policy thawed and refroze and socialism was deemed more or less achieved, Cubbin plots a distinctive path that was specific to Soviet designers. 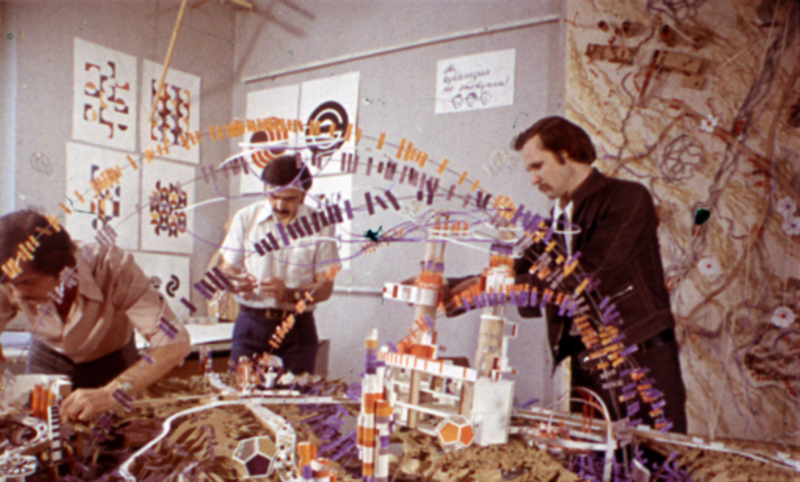 But he shows how they also breathed much of the same air as critical designers in the West at the same time: Archigram, Haus-Rucker, Coop Himmelblau, Ettore Sottsass and others, who likewise wished to design out alienation and passivity, eliminate commodification, and model whole environments of beauty, experiment and creativity. Cubbin coins a term, the ‘Communist Surround’, drawing on Fred Turner’s idea of the ‘Democratic Surround’. The Democratic Surround involved the fabrication of multimedia environments, ranging from Andy Warhol’s Exploding Plastic Inevitable, to the Museum Of Modern Art’s Road to Victory and Family of Man exhibits. These aimed to produce a tangible space of American democracy and consumption, as a counter-image to the use of mass media for indoctrination by totalitarian, authoritarian states. In Senezh’s Communist Surround, meanwhile, harmony was to be produced in the material environment, eschewing the creation of isolated artefacts and leaving room for changing tastes and fashions; but this operated in a context where the actual design objects and built environments were grimly functional. Senezh’s contributions were tolerated, but they seldom escaped the world of temporary exhibitions and one-off events. Their role became one of sustaining ‘optimism for the human soul in the midst of a utopian experiment that had strayed off course’. Cubbin has interviewed a number of designers involved with the studio and consulted a formidable array of sources, some of which are held in personal archives. His narrative with Perestroika, and the dissolution of the Soviet Union of Artists on 8 January 1992. Senezh appears as one of those entities that made sense only in its push-pull with what should have been. In the 1990s, as McDonalds entered the country, consumer goods production was trebled and an Italian design magazine was put into a Russian language edition, Senezh’s idea of ‘design’ was apparently obsolete. In showing how the much lauded avant-garde of the 1920s returned in a new form in the 1960s, Cubbin demonstrates how unrealised models have the capacity to return again and again. Senezh designers designed for a future they hoped might happen, in the idiom of a past that never came to be. Perhaps, when they too are rediscovered, they might exert some energies on our own bleak environments. Tom Cubbin’s Soviet Critical Design: Senezh Studio and the Communist Surround is available from Bloomsbury. Esther Leslie is Professor of Political Aesthetics at Birkbeck College, London. Her most recent book is Liquid Crystals – the Science and Art of a Fluid Form.